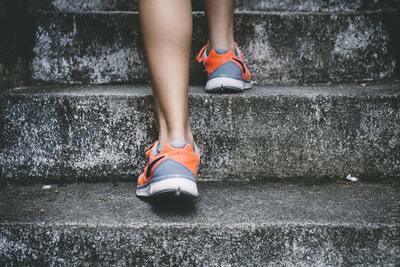 One of the more prevalent foot injuries from running, Achilles tendinitis sounds much worse than it actually is, referring simply to inflammation of the Achilles tendon that connects the calf muscle to the heel bone. Achilles refers to heel (just think of the famous Greek warrior who was killed after being shot with an arrow in his only vulnerable spot), while the suffix ‘-itis’ always alludes to inflammation in medical terms. Achilles tendinitis is classified as an ‘overuse injury’ and caused by continuous or repetitive exercise, resulting in the tightening of the calves and inevitable strain on the Achilles tendon at the back of the lower leg. How to Prevent: Apart from strength exercises and proper pre-exercise stretching that are commonly recommended to prevent this injury, it is also advisable for joggers to wear low-heeled shoes. These measures will improve the elasticity of the tendon and help reduce the strain from frequent exercise. Patellofemoral knee syndrome, or runner’s knee, can be a crippling injury that all joggers should be wary of. It is caused when the cartilage under the kneecap is damaged, due to overuse or injury, and results in the knee being unable to absorb the shock from running. When suffering from runner’s knee, joggers experience various degrees of pain, depending on the intensity of the exercise, and may even be unable to run until the tissue surrounding the kneecap has recovered. How to Prevent: As is the case with many foot problems from running, the key to preventing runner’s knee altogether is to wear the proper shoes and to replace your worn-out footwear immediately. Another simple precaution is to refrain from running on hard and uneven surfaces, and to adjust your running technique to always hit the ground directly underneath your centre of gravity (i.e. no toe-running or heel-striking). Another of the family of ‘-itises,’ plantar fasciitis is the inflammation of the tissue that connects the heel bone to the toes at the base of the foot. This nettlesome injury is mostly caused by overtraining and worn-out footwear, resulting in stabbing pain in the area of the heel and arch of the foot. How to Prevent: There are a few simple preventative measures that all runners should follow to prevent foot pain after running, including choosing proper footwear with the necessary support, incorporating low-impact exercises into their fitness routine, and doing pre-exercise stretches as to improve the elasticity of the muscles. Distance runners are especially susceptible to iliotibial band syndrome – a sport injury caused by the inflammation of the tendon that connects the knee to the hip, resulting in various degrees of pain in the side of the knee and hip. As with any type of inflammation, the problem only worsens with overuse and overtraining. How to Prevent: There are ways of preventing the injury from disrupting your exercise regime altogether. Apart from the golden rule of quality footwear and warm-up exercises, it is advisable for joggers to avoid running downhill too often and running on the same side of the road, as both will put unnecessary stress on a particular side of the hip and knee. Athletes and joggers who regularly intensify their exercise routines are especially affected by shin splints. The injury is characterised by various degrees of pain in the shin area of the leg and is the result of overworked muscles and tendons. How to Prevent: As such, the most important factor for the prevention of shin splints is to increase your running distance slowly and to allow yourself enough time for rest and recovery. It is also very important for joggers to be equipped with proper running shoes and to avoid hard surfaces. Toe raises and calf stretches are excellent ways of preventing shin splints and it is important to note that a professional sports podiatrist be consulted if an injury occurs.